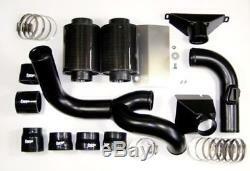 Forge Motorsport FMIND12F Seat Leon 1P FR 2.0TFSI Twintake Induction Kit. The Twintake induction kit has shown improvements of up to 17hp in our tests, when compared to the original air box/filter system. All the parts required are included in the Kit. This kit is available in black only with black hoses. The Twintake system is currently available for the 2.0 litre only versions of the VW MK5 Golf FSiT, TSi and Edition 30, Scirocco TSi, Audi A3 / S3 2 litre, Seat Leon Cupra(Fsi) and Seat Leon TFSi. Please note: double check your MAF sensor part number. Since 2009 the VW/Audi gorup have been changing the MAF sensors on their cars to a'more advanced' sensor which resists tuning and has the mounting plate mounted 180 degrees rotated from the original. However, many cars produced since 2009 still have the old sensor. Please check the picture below to make sure you have the correct MAF sensor; the part number is printed in white on the top. 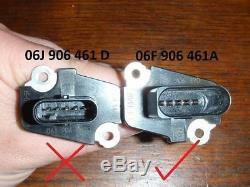 We currently have no solution for the new MAF sensor on any car. Please note: some items may need to be made to order and can take up to 28 days to arrive. Forge Motorsport is comprised of a small group of passionate automotive enthusiasts who are dedicated to designing, engineering and developing a wide range of vehicle specific and universal performance products for OEM and custom turbocharged applications. We are based in Gloucester England, where our headquarters and manufacturing facilities produce our ever growing range of products. We also have a full sales and distribution facility in Orlando FL to serve the North American market, and also in Taichung Taiwan covering Asia as Forge Asia. All Forge products are produced at our state-of-the-art facility in the U.
Billet parts are machined to the strictest tolerances and are subjected to ongoing and exhaustive testing and inspection. All our fabricated products are welded by our in-house master craftsmen. Welding is a passion of our staff and its unsurpassed quality in the marketplace is represented with robotic like precision. This means you will not only be getting an intercooler that performs second to none but it will look just as good on your car. We offer a range of fitting services at our fully kitted workshop which is located 5 minutes from the M65 in Great Harwood, Lancashire. (for Sat Nav accuracy please use the postcode BB6 7UF as the site we are located on is new and may not be listed in your Sat Nav). Found this item cheaper elsewhere? Please get in touch with us and we will try our best to beat the price! The item "Forge Motorsport FMIND12F Seat Leon 1P FR 2.0TFSI Twintake Induction Kit" is in sale since Friday, June 6, 2014. This item is in the category "Vehicle Parts & Accessories\Car Tuning & Styling\Engine, Tuning & Chips\Other Engine Tuning". The seller is "gnj_motorsport" and is located in Blackburn, BB1 2EQ. This item can be shipped to United Kingdom.